At seven in the morning the sea looks cold (it is – it’s the Atlantic) but already the pavements below our hotel room bustle with purposeful walkers, exercising before work. Along the marble-lined corridor a ‘do not disturb’ sign swings from a door handle. ‘El mundo puede esperar’ it reads. The ‘alternative’ signs and announcements that began on yesterday’s trains continue. After our wonderful breakfast (we give the cava on offer a miss) it’s time to head uphill. 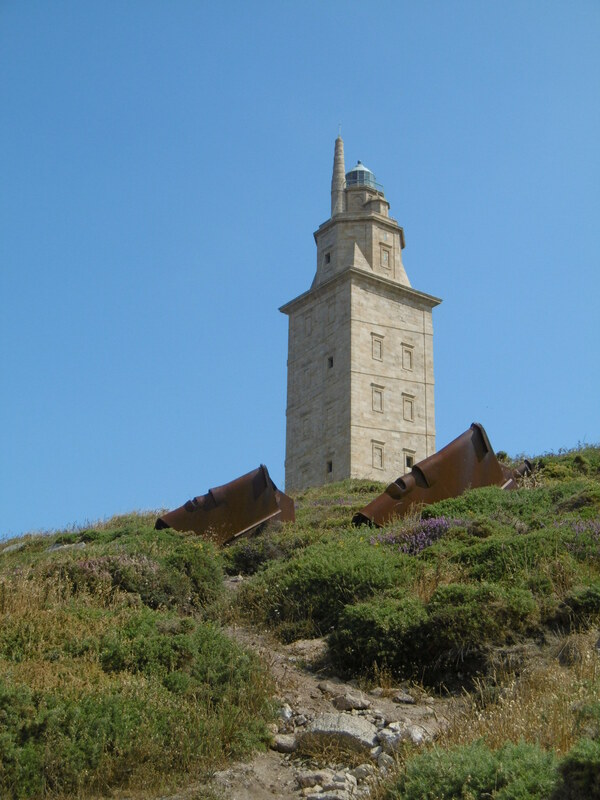 I‘ve no idea how far it is to the Tower of Hercules – the Roman lighthouse – but we set out at an optimistic pace, having looked at a map, confident it’s within my scope. The sun seems benign and the early morning tide is swooshing ashore with a welcoming freshness. All bodes well for a walk. By the time we reach the top of the hill – that leads to another hill – that leads to the lighthouse – the god of sun has settled into his day’s work. It’s warm. Correction – hot. A sandy cove below us looks enticing. But the Herculean lighthouse towers over us like a disciplinarian teacher. You will walk all the way. You will not divert to the beach. You have come to see me, Farum Brigantium, not to paddle. We sit on a bench for a while, casting lascivious glances at the clear water and pale sand. Then shuffle off to our second hill. It’s pretty steep for one used to a flat beach. We take it slowly, stopping for frequent scenically inspired oohs and ahhs. The footpath winds around the hill, taking us with it. Signage is minimal – and confusing. Do we go around? Do we go up? Do we go back to the bottom and start again? 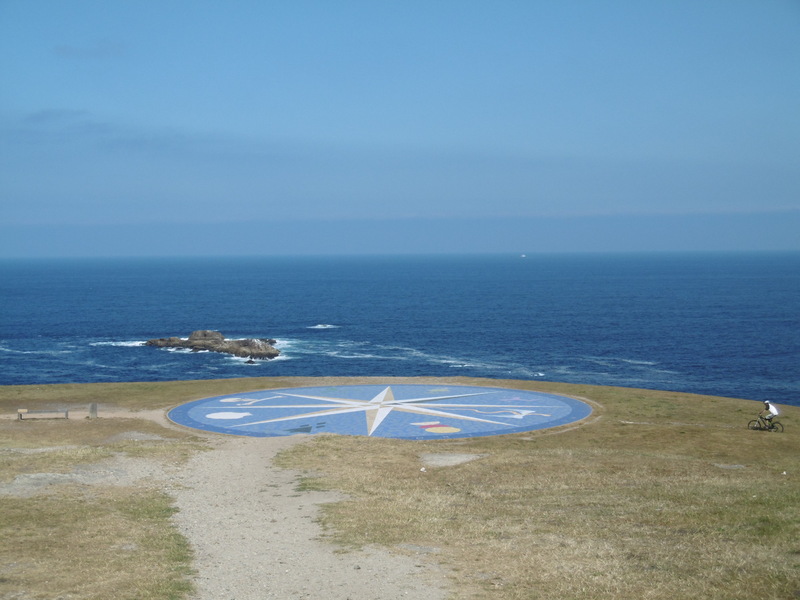 The compass rose representing the different Celtic peoples and a view out to – well, you never know, the end of the earth? Of course we don’t go back. Of course we go around. Of course the path doesn’t actually lead to the Tower. But we reach a viewpoint and make our eyes ache trying to see the end of the earth. 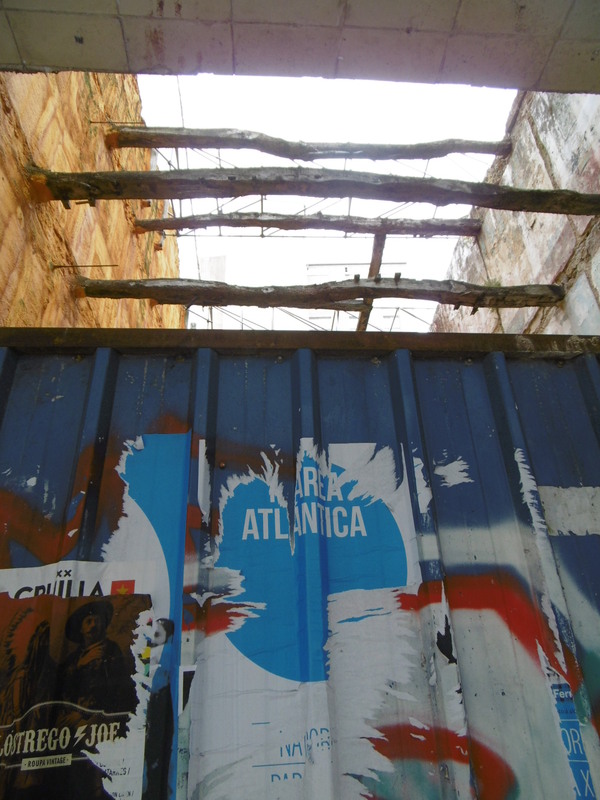 Is that Finisterre – Finis Terrae – out there in the ocean’s haze? Probably not – but it’s exciting, knowing that one day, long, long ago, the place where we’re standing was not far from the limit of the known terrestrial world. 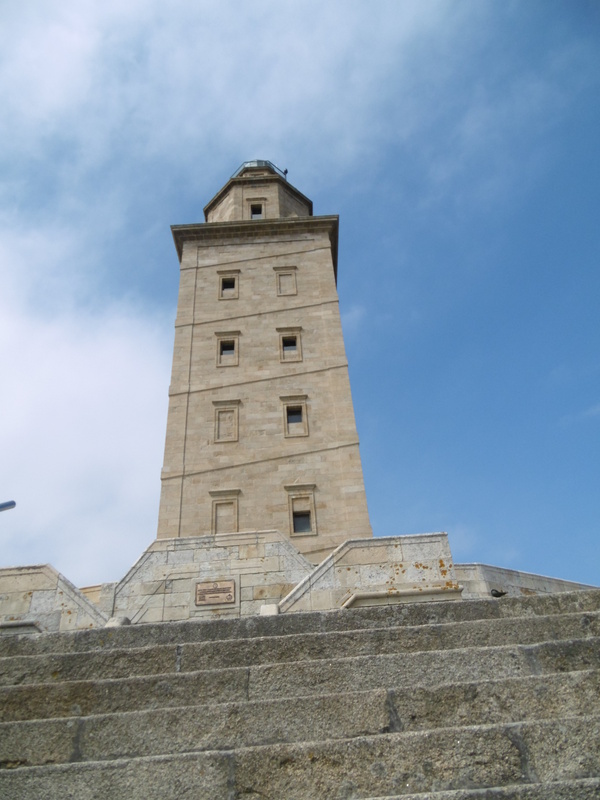 The unofficial path up to the tower is steep and slippery, but at last we stand beneath an edifice of stone, 55 metres high, that is the only functioning Roman lighthouse in the world. At least in part. Built in the first century AD, restoration in the eighteenth century added 21 metres to its height. We can’t confirm it works. It’s frowningly sunny. And there’s no way I’m repeating this journey after dark. It’s an impressive sight. But I’m pretty wiped out by the brisk walk up the first hill and our spiral round the second – so we reject the chance to (pay to) climb the stairs. But as we set off down, I spot a small building, ignored by visitors. A kind of solid, lighthouse-keeper’s garden shed. Nosy, we peer through a window round the back – and lo! 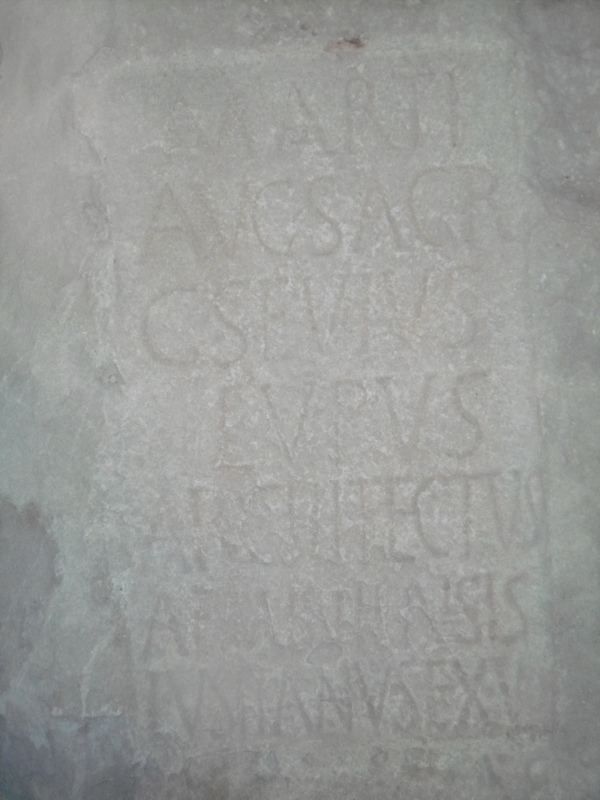 Within lies a real Roman stone with an inscription. The archaeologist is happy. I am happy. I was always (shhh don’t tell) rather a fan of Roman. In fact I even unearthed a bit of mosaic while volunteer-digging one weekend in the city of London, many moons ago. On the trip back down I do just that – the ground is ball-bearing-slippery with sand and a jolt has me anxious I’ve done some damage. But we sit a while and ogle the sandy cove once more. And all is well. Lunch is the big meal of the day here and the town is famous for its dish of pulpo – octopus – and potato. We head for the top recommended place and it’s heaving with locals. Wait? Or do some more walking? Well, why not. 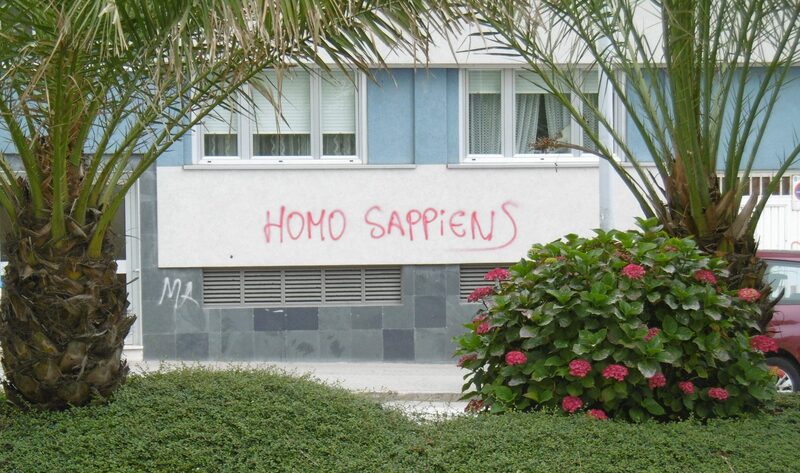 I may be weary but still have enough energy left to appreciate architecture – and graffiti. 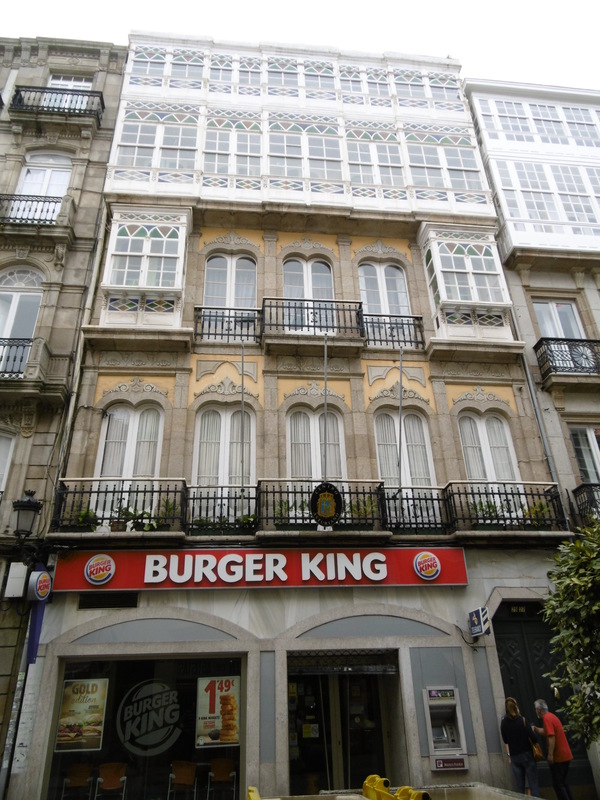 The famous windowed balconies are everywhere – as are the convents and churches and civic buildings. 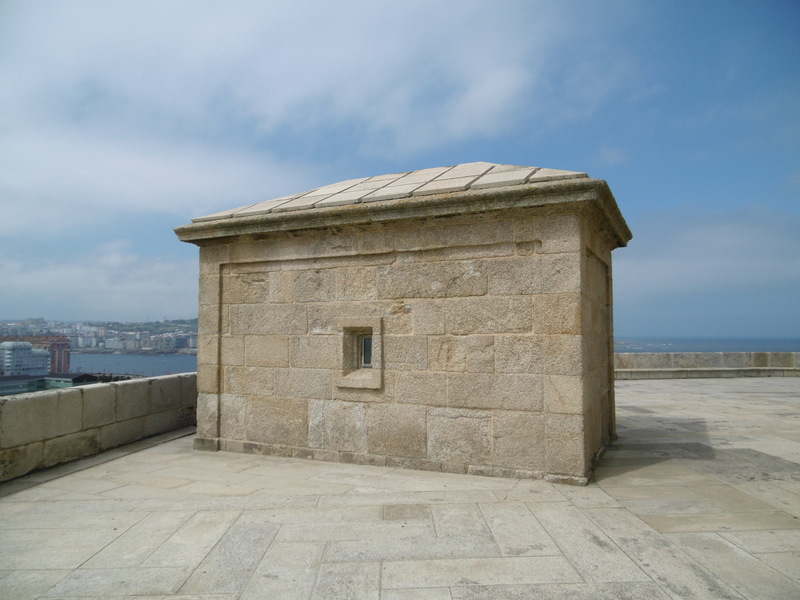 But A Coruña’s marina gets only a cursory glance of admiration as we turn around and, footsore, retrace our steps. A short wait secures us a table inside the restaurant. 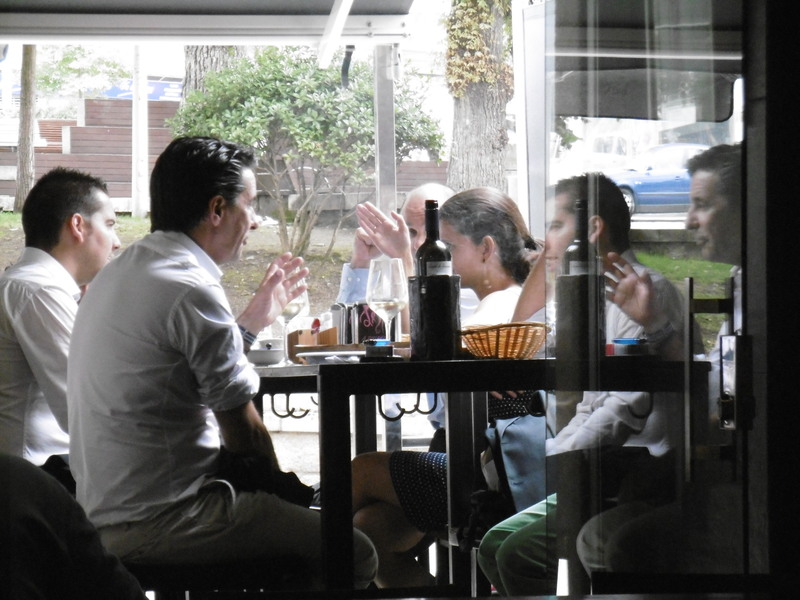 There’s very welcome chilled Albariño wine, by the copa – and then the famous pulpo. It’s delicious. 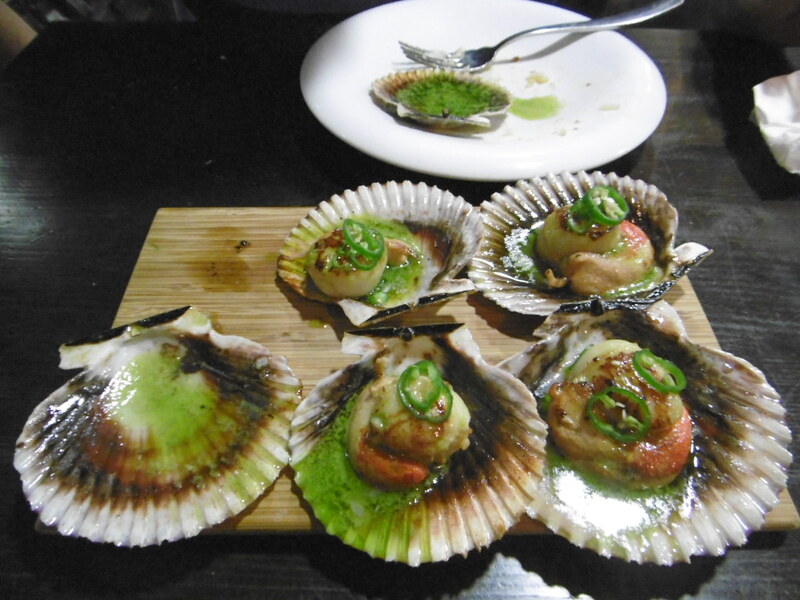 Sadly the picture leaves a lot to be desired so instead you can see the pretty scallops – and that vieira. Now, ‘Vieira’ has a special resonance for the man I’m with as it’s his mother’s maiden name. Part of her ancestry being Portuguese – a land we’re heading for in a few days’ time. But nothing has prepared us for the reality of this vieira. 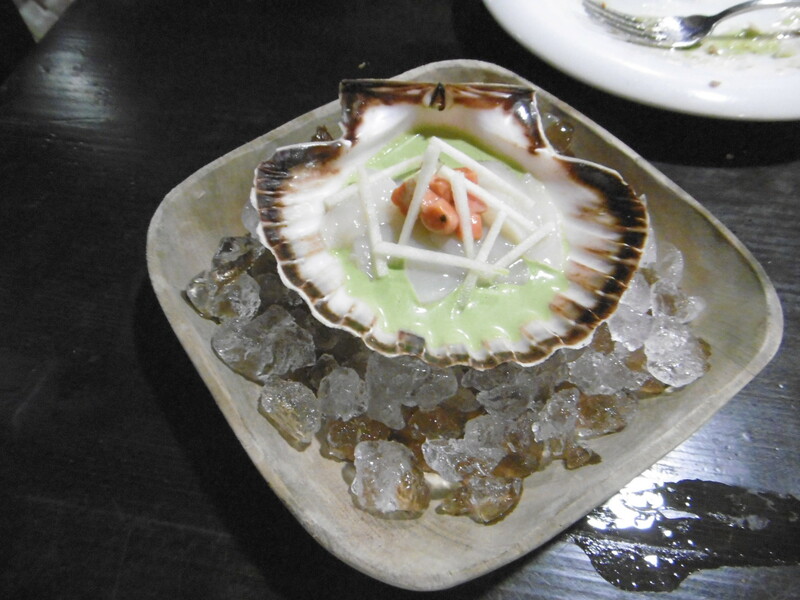 We knew it was a scallop – but what arrives is just one, lonely, chilly creature, sitting on ice in a large scallop shell. Would he have it again? No. Did he enjoy it? Moot point. And irrelevant. Back in our hotel, a siesta under our tighter belts and evening drawing on, we’re happily exhausted (and a little sun burnt in my case despite the factor 50). Time for another copa – Mencia this time, a Galician red – and a pudding. No need for dinner after that seafood feast. It’s an odd combination. Ice cream. Cake fragments. Dried red berries. Plain yogurt. Yes, all together. We retire to bed healthily tired – but also a tad too excited to sleep. Well, I am. After all, tomorrow’s the day I’ve been anticipating for years. Tomorrow I can be a pilgrim – and a tourist. We’re taking the train to Santiago de Compostela. St James and his field of stars awaits. 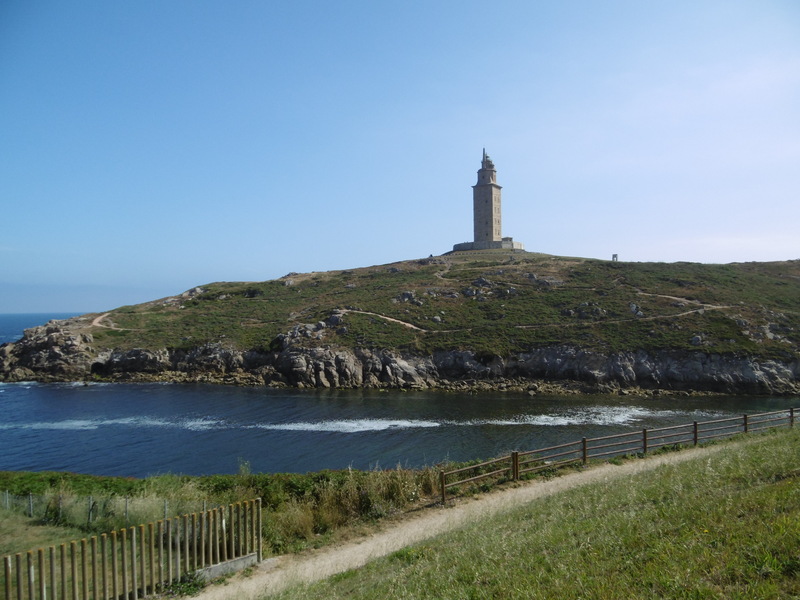 This entry was posted in Travelling and tagged A Coruña, Albariño, Finis Terrae, Finisterre, Mencia, pulpo, Santiago de Compostela, scallops, Tower of Hercules, trains, vieira. Bookmark the permalink. What a lovely vacation! I’m glad that all of your moveable parts are working! Keep the posts coming! It’s chilly and rainy here in the other Sydney. So lovely to be vicariously plucked from the grey to the sun and sights of Northern Spain. The sea does look inviting, and the climb steep. I’m not sure if I’d have your strength of will but you were well compensated by your find from many centuries ago… quite amazing the inscription remains readable. A vow truly kept. I’m pleased the slippery-gritty slip did you no injury, and you were able to carry on… to lunch! I can imagine the pulpo and potatoes, not pretty but tasty. The scallops (yum! cooked or not) are a connection to the next leg… I have probably impossible dreams of the Camino of Santiago de Compostela walk. ooh poor you! Cold but sunny here and it’s summer 😦 Next post short on food but the one after that should make up for it.There’s some more octopus donw the line in Lisbon but I do now wish I’d had the Galician pulpo again – really tasty in paprika and so fresh and not at all rubbery. 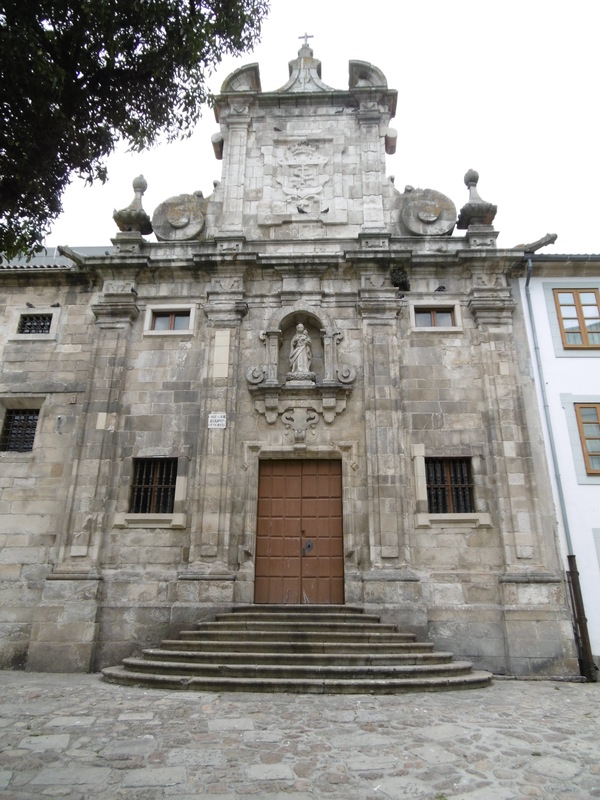 As for the Camino – I’d love to try – so if ever you decide you’re going to chance it … let me know! I do have this fancy for starting in Portugal now though and walkng north. After years of wanting to go through France and northern Spain. But – whatever. It is a long, long walk. You are such a marvelous writer and storyteller! Hats off to you for finding the Roman inscription — and also that bit of mosaic many moons ago (both would have been giddiness-inducing highlights for me, too). But I will move on now, for I am dying of anticipation to read about that train ride! You have no idea how lovely it is to read you say that, thank you! And thank you for joining me on he trip – albeit a bit late!